As some of you may know, I have a thing for stickers. I can't stand them. Not only because exclusive and premium sets should be using premium printed parts, but in 30 years time I want my grandkids to be enjoy them as they were originally intended, with the stickers intact. Because stickers don't usually last more than a couple of years on display in a heated room, and to guarantee they'll be intact when the time comes, I buy the odd spare copy. 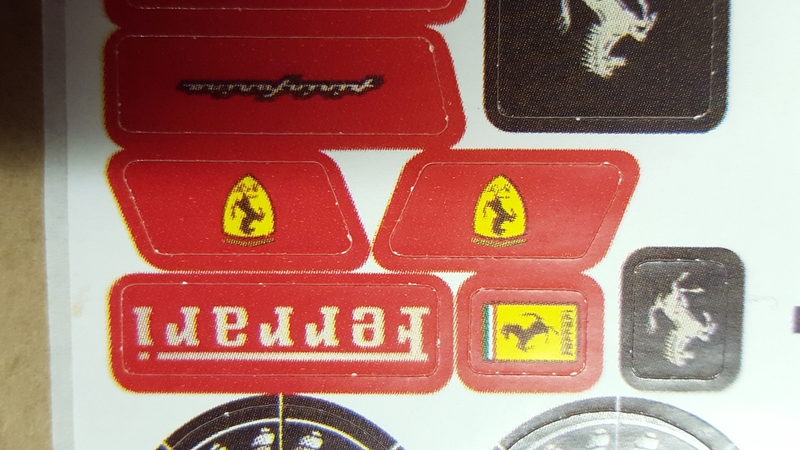 I was lucky enough to lay my hands on a sealed #8653 Ferrari Enzo last year and so of course I now need additional sticker sets, just in case. Because it's an older set there are few available on Bricklink and those that are available aren't cheap but notwithstanding, I bought a set and it arrived a couple of days ago. Unfortunately however, I have a feeling it might be fake. Many sticker sheets have passed through my hands and of the fake ones, the one thing they all appear to have in common is how poor the blacks are reproduced. I've taken some pictures below and to be honest, it's very difficult for the camera to pick up the variation, but to the eye it is far more obvious. Of all of the genuine sticker sets I have, I have not once, other than those cut small individual stickers cut from a roll in the warehouse, come across a poorly cut set. This one hasn't been cut square and looks like it's possibly been cut with a pair of scissors, blindfolded. Looks like it's been stuck down to something previously which may go some way to suggest it's authentic. I wouldn't want to give an opinion on these but I am aware that there are 'reproduction' stickers available on eBay for some sets. i've seen many fake Chinese sets (with fake stickers) too and the colours aren't exactly the same and sometimes the images are slightly stretched. 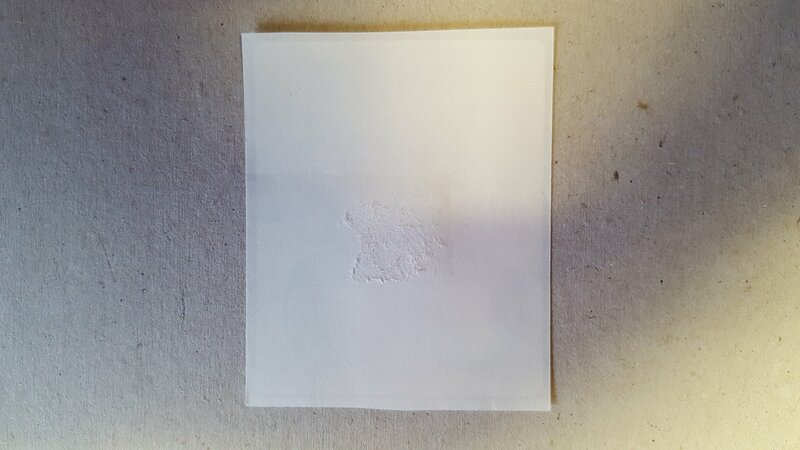 A key indicator might be more in the backing paper rather than the print quality of the sticker itself. ironically, the Chinese fake sets now print onto the pieces these days when Lego would use a sticker. Makes spotting fake sets slightly easier (when the original set had stickers but there's is printed) but also shames Lego for using stickers when they could print on pieces. I did check the backing paper and to be fair it does appear to be very similar. It's only for the quality of the print, coupled with the un-squared edges and lastly the size of the cut-outs aren't identical to the original (not just off centre but marginally different size) that have I have my suspicions. I think this problem is indicative of the state of our hobby these days. There are so many fakes and scams that you don't know who to trust and doubt the authenticity of items if you didn't buy it direct. however, I must add that when I've seen replacement stickers for sale they are sold as that and are not passed off as originals. I think in buying from BL with no ability to list a 'custom' or 'replacement', I suppose I trust I am indeed buying an original. Only official LEGO is admissible on BL. From Ebay I would expect and accept the risk and like you say, the listings more often than not state them being replacements rather than originals. As it turns out, there are fake chinese stickers available for this set on Ebay. But they are printing the words "replacement sticker" on the sheet without the correct Lego part numbers. These stickers are also not kiss cut as the originals. Since this is an expensive, low volume set I can't see too much profit in making a fake since the cost of a kiss cutting die isn't cheap unless you know someone who will do it cheap for you. Not to mention the equipment to do it. The print quality doesn't look as good but maybe they had trouble that day with the machine and since it was a short run they let it slide. Looking at the backing of the sticker they should be identical. Same manufacturer if you can see it and not having split backer. If this was a cheap, high volume set I would have suggested that there were two different manufacturers of that sticker, but that's not the case. The defect on the back of the "fake" sticker could have been from production if another sticker were accidentally stuck to it and the worker just pulled them apart. The only thing that really bothers me is the crooked cut sheet but that could have been an indication of a bad day on the press. Another possibility I thought of is that someone in the printing plant took sheets that were intended to go in the trash, we call it set-up or make-ready, and then sold them on BL. Only official LEGO is admissible on BL. - chromed LEGO parts, even ones that are nearly indistinguishable from official LEGO parts, as long as you list them as custom. On BL, I believe that sellers are more knowledgeable about their product and more inclined to list honestly. So your chances of avoiding counterfeit items is better on BL. But I wouldn't assume it is legitimate simply because it is listed there. So on my quest to buy a replacement original sticker, it seems I've come across another fake. There can be no question regarding this one. 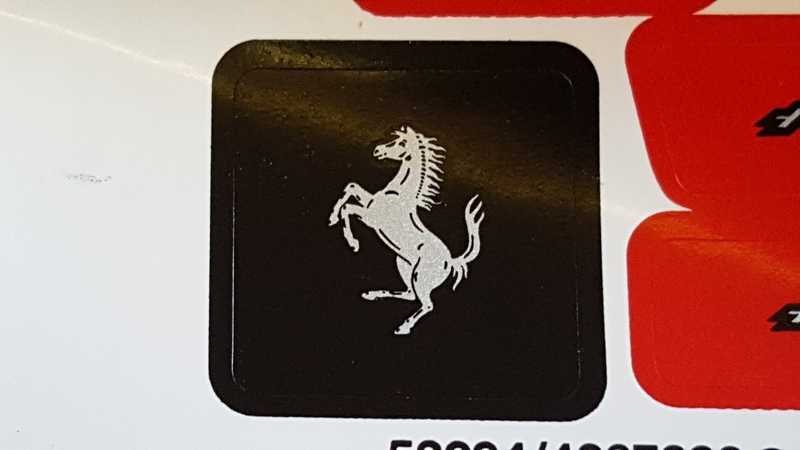 What's supposed to be silver (the Ferrari stallion and it's name) is grey, the cut edges of the sticker have nearly gone through the backing paper, the print quality is awful and the scan quality is even worse....it's pixelated. What's a guy to do to get an original sticker around here? It was bought as new from an established and trusted seller. Was issued a refund within 90 seconds of requesting it. Still, I want a real one. ^ I don't blame you for wanting a real one. I would still leave negative feedback to discourage the seller from doing this again. It's a reputable seller from whom I've bought from before. When asking he said he bought it for personal use a few years back but didn't use it. Didn't check it either. I've no reason to not believe him as I've had plenty of good buys from him before, just really annoying. But the biggest question, why oh why has someone created a fake of a pretty obscure set? It makes no sense. Or maybe it makes a lot of sense. Nobody prints fake £50 notes, but plenty of fake £10 and £5 fakes out there. I think the only answer to this is for Lego to either sell spare sticker sheets for sets or move over to printed parts instead of stickers. Unfortunately the cost of both solutions is probably more than TLG are prepared to do. But honestly the RRP of sets is set so high these days TLG could probably absorb the cost of printing everything onto the Lego. You can't really do that with a lot of parts. There are plenty of stickers that encompass more than one part when applied. ........But the biggest question, why oh why has someone created a fake of a pretty obscure set? It makes no sense. Or maybe it makes a lot of sense. Nobody prints fake £50 notes, but plenty of fake £10 and £5 fakes out there. Also, because it is such crappy quality one would think that if the seller who had it sells tons of sheets they would know a knock off from the real thing. I can't think of any STAMPs in the last few years though, so that reason doesn't really fly. But there are plenty of other reasons not everything is printed anyhow. Although expensive for new molds, TLG could make one part for the printed sections of sets like the Mystery Machine or other STAMPs. TLG can also print across two parts. Eg. CMF body to legs printing. The only problem with printing parts that are supposed to line up when put together, is that many times they don't. At least with stickers, you can make sure they line up. Maybe I am missing something, but surely this could be the kind of thing that LEGO sells at cost to customers? You've probably answered your own question by going on to mention licensed sets. The terms of such licences will probably exclude the production of stickers - it's different when it's part of a construction set. It's much the same reason that keyrings are "glued". Then you start to get into the area of keeping track of which sticker sheets they can produce and which they can't, and explaining that to customers - especially when it's the licensed ones which are likely to be most in demand. In short, it's just not worth it. ^ But they do. They sell non-licensed ones directly to the consumer. Only if you were to ask for a licensed one would a red flag appear on their screen prompting them to decline your request. I buy my non-licensed ones from TLG and others from BL. RRP is high, but we don't know how much they're actually making. I'm sure their production costs are rising. I'm not necessarily trying to defend them, but saying they can afford to print due to their price is just a random assumption. One piece per sticker. Just lots of sticker needed, and all a pain to line up together! There is nothing random about my assumption. If places like Amazon, Asda, Tesco, Sainsbury can afford to sell lego at 40% off or more, they are definitely paying TLG less for their supplies. TLG are therefore making at least 40% profit on any set they sell at RRP. Now I know TLG are not posting profits that high. Due to taxes and costs of running shops and swanky new London Headquarters and a New Lego House in Billund etc etc. But they are the World No1 or No2 Toy manufacturer? In my view they could easily absorb the cost of printing parts. Which would be offset by a decrease in the cost of printing paper/plastic stickers and a decrease in the cost of making sure those sticker sheets end up in the correct boxes. etc, etc. At least with stickers, you can make sure they line up. There is a lot more involved in switching to printed pieces from stickers than simply printing on plastic instead of paper. How much does it cost to print a sticker vs. printing directly on a piece? 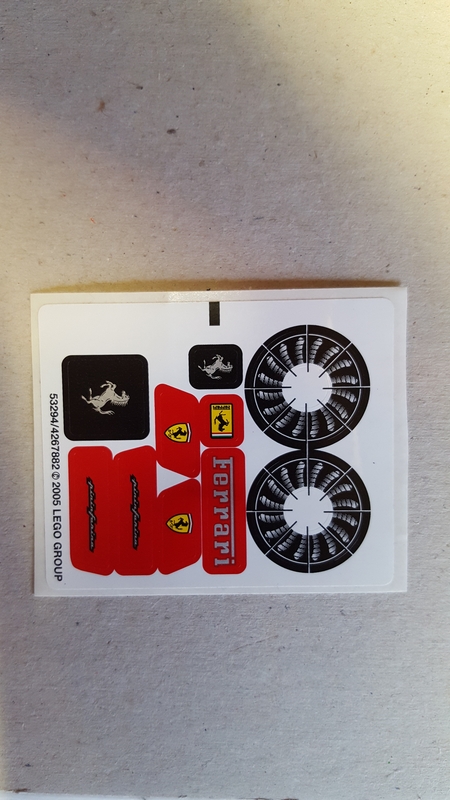 How much does it cost to print a sheet with 20 stickers on it vs. 20 uniquely printed parts? How much more expensive is it to maintain inventory for 20 uniquely printed parts vs. "generic" parts and a sticker sheet? No, there are no STAMPs in the Mystery Machine. The only two sets in the past five years that I know include STAMPs are #10219 and #10241, though it may be that there are others in themes I don't pay much attention to. Generally, it seems to me that the LEGO Group has made a firm decision not to use STAMPs any longer except where the alternative would be mutilating a corporate brand name or logo. And even then it seems like they're not as delicate with all brands and logos as they have been with Maersk — #74874 cuts the Chevy logo in half to fit it on two stickers. Either way, printing tolerances are generous on LEGO parts. I have seen so many errors over the years; especially on minifigures. You can get away with parts that are not supposed to line up. It is probably far cheaper to request replacement stickers than LEGO parts and this is what TLG chooses to do. It is very easy to ask a a company like TLG to "absorb the costs" when it isn't your company or business. It is a very "liberal" way of thinking; ask the rich to dip more into their pockets, so the masses can benefit from it. Inventory costs is a good shout, I hadn't thought of that. Unfortunately that's another indicator that Lego's production and storage facility is a tad too small for the size of the company. If they're struggling to meet demands at Christmas, and the quality of their stock is suffering because they're forced to use stickers instead of printed parts, then either they need to step up their facilities or shrink in size. I wonder which will happen first? That's just silly. It isn't the number of parts that is the issue - it's the number of different ones. Not only does make things more complicated but it means you have a larger stock, sometimes never used. I don't know whether you've seen their warehouses, but they hold about half a million creates containing around a billion pieces. They're only run at 80% of capacity so there is already slack in the system if it's really needed. There's no real evidence that they are. Whatever they do, you'll always get local short-term shortages, and sometimes they simply underestimate demand. For a start, most kids LIKE stickers. Secondly, it's not a matter of them being forced do use them; it's just impractical, and probably not cost-effective, to print everything. No, there are no STAMPs in the Mystery Machine. My bad. I don't have the set and was going by the set pics. Don't know whether the split sticker across the side is a better or worse idea than the STAMP that I thought it was. Probably better in that case, since there's a hinge there and constantly folding and unfolding a single sticker might damage it in the long term. If there weren't a hinge it'd be more debatable. Except for lining the stickers up I guess. The thing I find interesting with the stickers is that they put stickers in the high end GBHQ-like sets, but manage to print the parts in the low end juniors range. Now I can look past myself long enough to realise that the quanitity of sets sold probably makes it worth while doing it this way, the profit from these small sets probably contributes more than the large exclusive sets. But, when you make something that is the top of the line, the set that children will dream of owning, the one to put in store windows to drag people in to store to buy the small sets and coincidently the ones that we as collectors want to own - should any expense be spared? If these sets don't make enough money, can them, if they don't make enough money but are fantastic advertising, then do them properly and print the parts. For example, a lot of top end sports cars are sold at a loss to the company (in limited numbers) because they can easily recoup the cost by selling loads of the more affordable versions at a huge profit. Lastly, on a storage front, Lego are fantastic at putting parts in bags, how hard would it be to put all the printed parts in a bag and then put that bag in each box? Then your storage is reduced to one crate of bags of printed parts per set. Easy enough to crack one open when a part is reported missing or broken surely! Oh, and I suppose we should nod our head to the topic by saying something like; printing the parts would make them harder to counterfeit. Or easier maybe. Either way @Legoboy 's situation would be different. ^ it might be that younger fans will not be able to place the stickers well, and they will peel of extra fast, leading to many complaints and/or choking hazards. Not only ^^ about kids playing with the sets. But also, if they are advertising in the sense of people looking at pictures of them or instore, then stickers will not be noticed as much as when it is actually being built. So no need to care too much about them when they are being used as advertising. ^I have to disagree with that, people spend far more time looking at something before they purchase than after - especially the parents who have the money. That is why the cabinets they use aren't dark and dusty too. Advertising has to be the absolute best you can show off, otherwise you are advertising your flaws (which in this case Lego do and get stick for each and every time from us lot!). I agree you would notice them when building, but I don't look at my UCS sets and see the stickers now they are out on the shelf, but I sure as hell notice them when the first pictures come out! A juniors set is an incredibly simplified System set. When a vehicle has a big base, and the sets make a point to avoid 1x1 plates, of course they won't use stickers. Even putting aside set size and production numbers, of course LEGO prefers to print parts in themes like Duplo and Juniors, because those themes are aimed at small children and beginning-level builders who need the building process simplified for them. Sets aimed at TFOLs and AFOLs are a different matter because teens and adults are generally assumed to be more capable than preschoolers and kindergartners. I think the notion that LEGO should sell their high-end sets at a loss just for the good publicity is silly. LEGO gets all the publicity they need without having to design sets to be sold at a loss. Based on the comments I see about LEGO sets on Facebook outside of AFOL groups, the news articles and news article comments I see about LEGO sets outside of AFOL fansites, and how the LEGO Group has been doing financially, it seems like most LEGO buyers don't consider stickers a huge imposition. This doesn't really solve the storage problem at all. You can't put parts directly in a bag straight off the machine unless they're all coming off the same machine in the first place (like, say, LEGO Friends kitchen accessory packs, which all come off the same mold). Normally, you have to have a bin to catch all of a certain type of part as they come off the machine, then that bin has to be stored someplace until all the parts are ready to be packed, and then it has to be moved to the packing area. The storage/floor space concern isn't a matter of where the parts will go AFTER they're packed, it's about where you keep them BEFORE they're packed and how many machines you have to dedicate to making them. Let's say a set has 20 different elements that need to be decorated. If you use a sticker sheet, that means you have 21 elements to manage: the unprinted versions of the elements and the sticker sheet. But if you print all of them, then you have 40 different elements to manage: the unprinted versions of the parts and the printed versions of the parts. Bagging the printed parts together doesn't subtract from the complexity, because the bagged part is effectively one more element from a storage/logistical standpoint. There's no logistical advantage to bagging the printed parts together over bagging them with the other, unprinted elements. Also LEGO keeps their total number of elements under fairly tight control. If you choose to go with the 40-element solution instead of the 21-element solution, that means 19 element slots that the LEGO Group cannot devote to other things like recolors or printed minifigure parts, in that set or others. This is part of why it's in the LEGO Group's best interest to commit new elements to either small sets that will be manufactured in very large numbers, or to parts that they can use across a wide number of sets and themes. On a similar note, one part they're printing for those larger sets is effectively one part they aren't printing for smaller and more widely distributed sets, because the LEGO Group only has so many printing machines and they generally strive to make efficient use of those machines. Furthermore, there are some parts and even surfaces of parts that LEGO has never really printed. For instance, the non-sloped sides of a slope brick/roof tile. So if a set needs a surface like that decorated, then LEGO can either print a sticker sheet using machines and fittings they already have, OR they can engineer and manufacture new mechanical fittings for their printing machines so that specific part can be positioned correctly for printing. In a bigger set with lots of decorations the costs of the latter option can quickly begin to add up! ^I didn't say that Lego should lose money, I just used an example of a marketing technique, very similar to that used by Lego, where companies do lose money on a partiular item. I have never walked into a Lego (or other) store and they had juniors (or low end) sets made up for people to look at (although it probably happens sometimes in those display cases). Nor have I seen a catalogue for Lego where they had a double page spread dedicated to there low value sets. I'm not underestimating the amount the small sets make, I am just pointing out the marketing potential the bigger sets offer. There is no argument that a printed part looks better than a non-printed part so therefore (in my head at least) why would you want them put out on display to try and sell sets when it isn't the best they can possibly do. My suggestion as to whether they could bag the parts up, just tries to minimise the storage space they take up in the storage space, in the manufacturing space then you would still generate issues with the production of the parts etc. But that wasn't the point. As for everyone saying, yeah but children can't do stickers, this was simply an observation that price clearly isn't part of the argument (otherwise they couldn't afford to put a printed part in an £8 set). I'm calling out top end sets only here. I for one would argue against the notion that a printed part inherently looks better than a stickered part. There are times when stickered parts can allow for much brighter colors or a wider range of colors than printed ones. Printing a light color on a dark-colored part will often make it look faded, but print it on a sticker and it's pretty much guaranteed to be bright and vibrant. That's not even getting into some of the more advanced things LEGO can do with stickers that they can't do with printing, like mirror finishes or holographic patterns. Stickers don't always work or look better than printing, but I don't think they always work or look worse either. And for me they tend to be a very enjoyable part of the building process. Price IS part of the argument for exactly the reason you claim it isn't. It's more economical to put one uniquely printed part in a $10 set than ten uniquely printed parts in a $100+ set, because LEGO is producing far more of each $10 set (and consequently, more of each printed part in that set) than of each $100+ set. It's simple economy of scale — the more of a particular part LEGO makes, the less that part costs them per unit. And that's not even getting into how counting minifigure parts, Ghostbusters Firehouse Headquarters already has FAR more uniquely printed elements than a typical Juniors set. LEGO CAN afford to put lots of printed parts in sets like the Ghostbusters Firehouse, and they DO, but it's evidently not enough for some people unless every uniquely decorated element is printed. They will be making a lot more £8 sets than the high end sets though so they get economy of scale. Setup time/cost as well as inventory cost is high so worth it when you are making a million of them, when its a fraction of that these costs per piece is much higher. Lastly, on a storage front, Lego are fantastic at putting parts in bags, how hard would it be to put all the printed parts in a bag and then put that bag in each box? I doubt this would happen, especially now. All the parts of minifigs were often in just one bag (with other pieces). Now, they seem to be spread out over as many bags as possibly. The reason, at least in part, was that the older method made it easier to pilfer desirable minifigs. It would be crazy to put all the unique printed parts in one place for much the same reason. The thing is, it wouldn't reduce the storage space. If you had say 20 printed parts in your bag, they would each have to be stored separately until the complete set of parts had been printed - when, yes, they could be bagged and reduced to just a single item in the inventory. The alternative would be to have 20 printing lines working in parallel and the bagging being done by combining the output of those lines. Not only would that entail modifications to how the factories operated, but it would lose flexibility and, if one printing line developed a fault, then all 20 would have to be stopped. I disagree. I look at stuff more after I purchase them. Most days in fact. If not, why bother buying? Plus I doubt many people that are not going to buy a set spend ages looking at it in detail. They may see GB, think it's cool and then purchase a smaller set (hence it acting as advertising). Will they care that they can see stickers if they look really closely at it, studying it in detail? When there is no intention to actually buy that set. I feel like stickers from the past year or so feel more robust than they were up until that point. 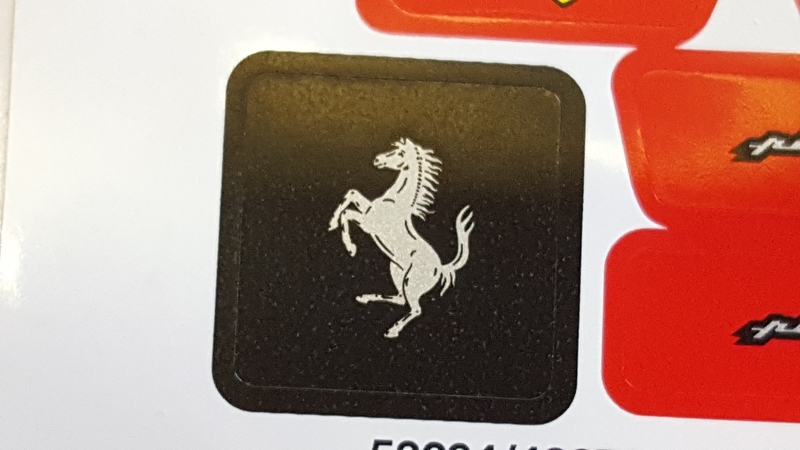 When I got #70732 I noticed that the stickers were shinier than I was used to, and to me they seem a bit more resilient. They almost feel like the waterproof stickers LEGO uses for sets that are designed to float on water. But of course, it's been less than a year since I first noticed this so at this point there's no telling whether they'll stand the test of time better than the previous not-so-shiny stickers. Has anyone mentioned the Dr Who set yet? That has a ton of printed parts, and is a (presumably) limited run. If they can print parts for that set, they can do it for all of them... Or I'm missing something. ^ How many printed parts are in that Dr. Who set? How many are unique to the set? Parts like #442776 (used in 92 sets) and #4255629 (used in 83 sets) would have much less impact on the price of a set than #6132561 (the door for the Tardis, used only in this set). A single printing run that creates a part used in 92 sets is much more cost effective than printing smaller batches of varying parts, because they have to reset the hardware between batches.